Beyond Frontiers Audio (BFA) was founded in 2009 to design uncompromising, high-performance, handcrafted, hybrid electronics. Presently, the company has a three-strong ‘Tulip’ amp range, comprising stereo and mono power amplifiers, and the integrated amplifier tested here, all of which share the same substantial aluminium chassis. Weighing in at a meaty 42kg, the Tulip SRPP is one of the heaviest integrated amplifiers in current production. There are good reasons for that high mass, though; a rigid chassis minimises the deleterious effects of flexing or resonating PCBs and this makes the amplifier more frequency stable as a result. In addition, the Tulip SRPP is rated at 250 Watts per channel and that large chassis is a useful means of heat dissipation. The ‘shared chassis’ concept extended back to the previous iteration of the Tulip amplifier, but similarities end there. The original version of the Tulip simply sported a capacitor between the valve and solid-state stages, but BFA radically revised the amplifier. Specifally, BFA followed the logical progression from understanding that capacitors undermine sonic performance to actually removing those capacitors--something that was hitherto impossible in a shunt-regulated push-pull amp. The Tulip SRPP is a hybrid design that achieves all of its voltage gain thanks to a pair of JJ Tesla ECC83S valves, together with two E88CC valves as a virtual ground reference. This voltage gain stage drives an output stage made up of Toshiba bi-polar transistors. The amplifier is a unique design by amplifier expert and BFA head designer Andria Saolcki, where the valve gain stage is connected directly to the transistors without capacitors or coupling transformers. The idea is that you get a direct valve sound that combines the freedom and openness of OTL (output transformerless) designs with the ability to drive virtually any loudspeaker thanks to the transistor output stage. BFA’s Tulip SRPP has zero global or local feedback and uses passive relays for volume attenuation, for the best possible signal attenuation. At power on, the dot matrix display on the front panel tells you how many hours the valves have been run for, followed by a deliberately slow valve warm up designed to maximise valve life. The display shows input and volume, with a descending decibel figure as well as an ascending numerical level to keep both nerds and real people happy. Controlling the Tulip can be achieved from the front panel button array, or through a supplied remote handset. Instead of the standard ‘plastic fantastic’ handset, the remote matches the amplifier in its brushed aluminium finish, although this can make button legends somewhat difficult to read. And ‘difficult to read buttons’ is one of the few criticisms you can level at the Tulip SRPP! 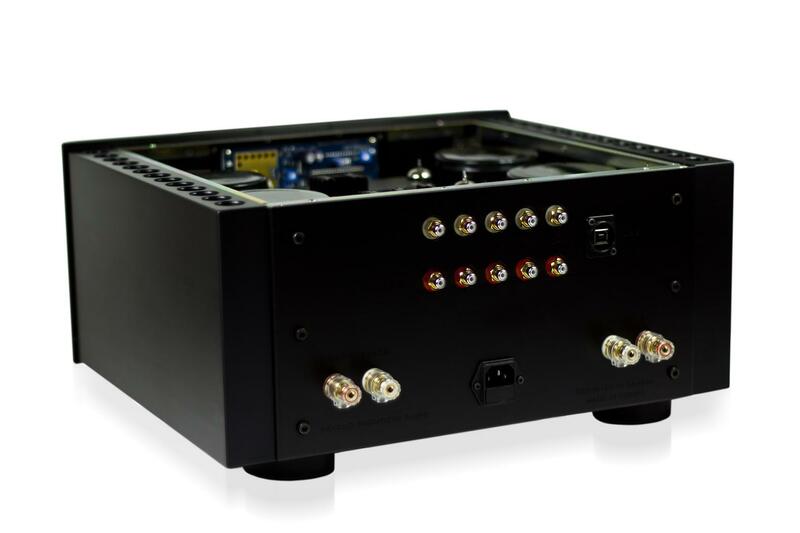 This amplifier is a single-ended design with four line inputs on high quality RCA sockets, and there is provision for optional preamp outputs should they be required. Our sample came with the optional DAC instead, which offers two coax S/PDIF inputs and a USB socket. This is the first high-resolution USB input I’ve encountered that does not require custom drivers for Windows users; let’s hope that is a portent of USB inputs to come. The DAC chip is a Burr Brown 1794A, which upsamples all incoming signals to 24 bit/192 kHz precision as standard. The Burr Brown chipset in the Tulip SRPP was chosen for sonic performance when properly implemented, rather than specifications in a resolution arms race. In a world obsessed by DSD and 32bit, 384kHz processing, this may seem like a controversial statement, but it is one that many digital designers subscribe to… even those who have ultimately chosen to go down a different path because of commercial demands. I can’t help but admire those who stick to their guns, especially when those guns sound this good.